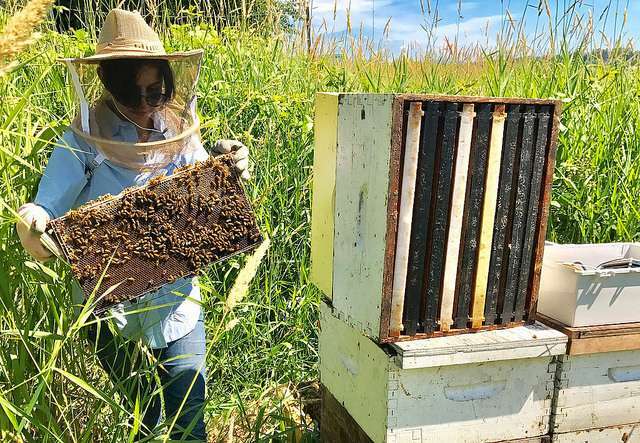 Simon Fraser University graduate student Oldooz Pooyanfar is monitoring what more than 20,000 honeybees housed in hives in a Cloverdale field are "saying" to each other—looking for clues about their health. Pooyanfar's technology is gleaning communication details from sound within the hives with her beehive monitoring system—technology she developed at SFU. She says improving knowledge about honey bee activity is critical, given a 30 per cent decline in the honeybee population over the past decade in North America. Research into the causes of what is referred to as Colony Collapse Disorder continues. The presence of fewer bees affects both crop pollination and the environment. Pooyanfar's monitoring platform is placed along the wall of the hive and fitted with tiny sensors containing microphones (and eventually, accelometers) that monitor sound and vibration. Temperature and humidity are also recorded. Her system enables data collection on sound within the hives and also tracks any abnormalities to which beekeepers can immediately respond. "To learn about what bees are communicating, we can either look at pheromones—the chemical they produce—or sound," says Pooyanfar, who initially received funding through the MITACS Accelerate program. The City of Surrey is providing the field space for her research. "With this monitoring system, we are collecting data in real time on what the bees are 'saying' about foraging, or if they're swarming, or if the queen bee is present – right now we are collecting as much data as possible that will pinpoint what they are actually doing." Pooyanfar, a graduate student in SFU's School of Mechatronics Systems Engineering, plans to eventually manufacture a sensor package for this application to help lower the costs of monitoring and allow more beekeepers to monitor their hives in real-time. Her initial-stage research was featured at the Greater Vancouver Clean Technology Expo last fall.